This is not a pretty picture. It is not meant to be. Only real. Finding beauty is up to you. How deep and long are your willing to look, knowing you can look further now through the thinning trees? It started with a ride, perhaps the most frightening I have taken by choice. A simple ride up the Ute Creek Trail, without another horse or human on the way that day, perhaps for days. From my barn, perhaps a 16 or 18 mile ride, into the Weminuche Wilderness and back. But here’s the real challenging part: I rode Flying Crow. Without wishing to make this all about horses as I’ve been tending to do as of late (it’s that time of year, you know), let me just say I was scared. At one point (for those who know the trail, the section known as the Funnel Cliffs by the old timers), I dismounted and walked. I hate to admit that. That goes against… what I believe for horse training, for riding, for making it up this trail. Yet, it goes along just fine with my sense of survival. After my horse stumbled off the trail so many times already (“What are you thinking,” I actually yelled at him, though I think the problem was that he wasn’t thinking; he was too busy looking around for the bogy man that never showed), and knowing this section would allow no room for error, I decided not to risk it. I got out of the saddle, held his reins, and walked for fifty feet, and cussed him, Arabian horses, right brain behavior, and my choice of horses the whole way. On the return trip, however, I remained mounted, and as you can see from my being here to write about it, I survived. What I wanted to share were my observations of the mountain along the way. I will try to keep emotion and comments to a minimum. Elevation was between 9,550’ where I crossed the Rio Grande and 10,950’ above the forks of the Utes. I viewed a varying percentage of beetle kill along the trail, from less than 10% (down at the River crossing), to 75% or more of the spruce. 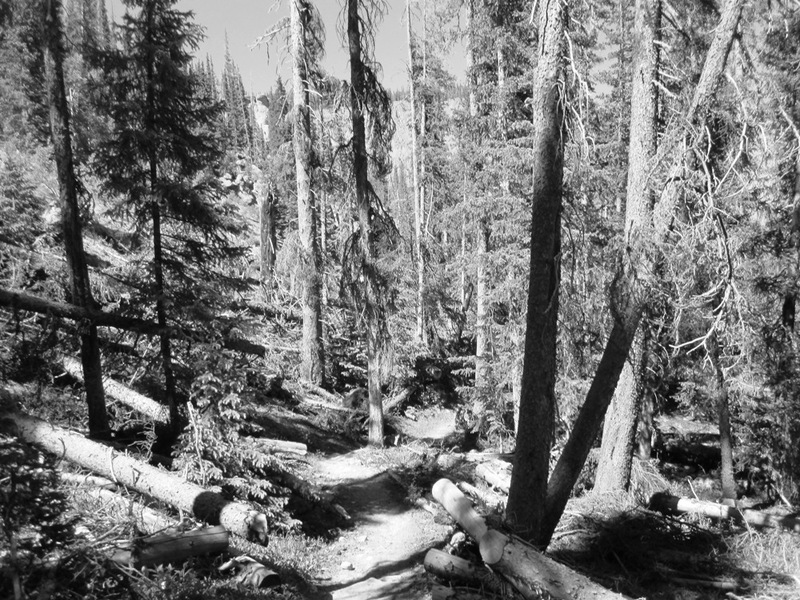 It is often the green trees being blown over (and having to be cut and cleared from the trail in order to ride on). Even needles catch the wind. Needle-less trees allow more light on the trail. The trails and hills are more exposed due to fallen and/or needle-less trees, making a once cool and shady horse ride rather hot. I had promised Gunnar it would be a cool, shady trail. I lied. Places where we have always ridden through bogs hidden in dark timber are hard and dry. The sun was shining on them directly. A horse’s footfall is silent when crossing needle lined paths. Clear before me, from as close as my kitchen table, I see the changes. At times it feels too close to home. For this is my home. Next year may be a cold and wet one. But these trees, the deep green mountain, won’t return as long as I live, as long as my child lives. I leave you then with this. Delicate balance of hope. A unusual white columbine, so fine and pure, found no higher than the bank of the Rio Grande as she cuts across our property. Wow Gin, it almost looks like a war zone. Is there anything that can be done about these destructive creatures? Ute Creek Trail goes by Black Lake right?? Thanks for sharing, I know this plight breaks your heart. Yes, Lisa, and the top photo was taken just below Black Lake. My first trip up Ute Creek Trail was in 1980. My initials are still carved on a aspen tree where the trail turns towards the wilderness leaving the reservoir. We rode horses rented from Hank Chafin at Sky High Ranch. I too remember going through what we (dad and I) called the canyon. Loose shell rock above and below the trail, winding on a path that edged the cliffs with the river racing below. Made my heart pump with excitement. I can still recall the sounds of the water and forest. The feeling of being so small in a place so grand. I long to return and feel it again. Until later this summer my memory will have to do. Many trips were made after that first one. I know it’s changed. Sad about the damage to the area you describe, yet the beautiful white blossom you end with brings hope and joy. 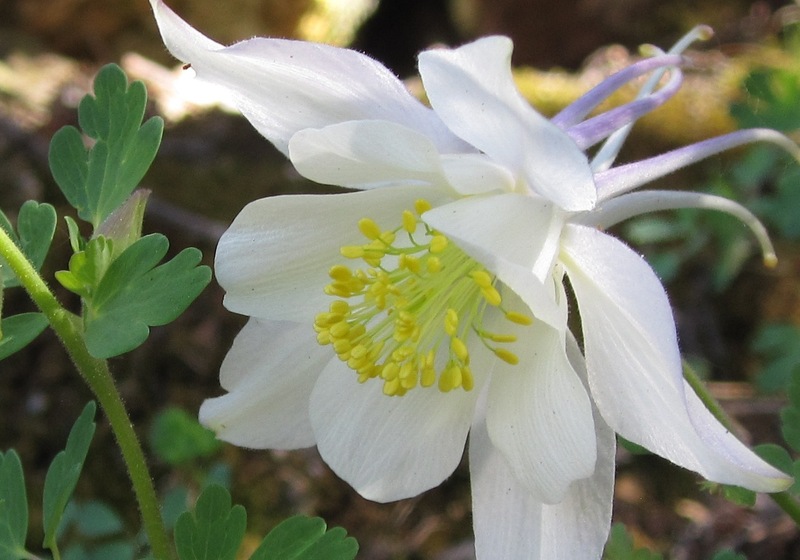 I’m so glad you shared the beautiful white columbine at the end because my heart was certainly sinking seeing all those downed trees…I didn’t realize they would fall so fast. But I guess the beetles have been working on them for, what?..a couple years now? When I show people photos of my stay at the ranch last year, no one notices the brown trees and I don’t point them out. I know it will look different when we see it in a couple weeks, I am prepared, but I will look and listen for the beauty that I know is there.